What is causing weather systems like Harvey and Florence to slow down and produce historic rainfall and flooding? PBS NewsHour science correspondent Miles O’Brien looks at the growing risk of hurricanes and the evidence that it’s tied to climate change. Next, Miles O’Brien looks at some of the science behind hurricanes and what might explain the historic flooding that recent storms have delivered. It’s the latest installment of our weekly series on the Leading Edge of science and technology. 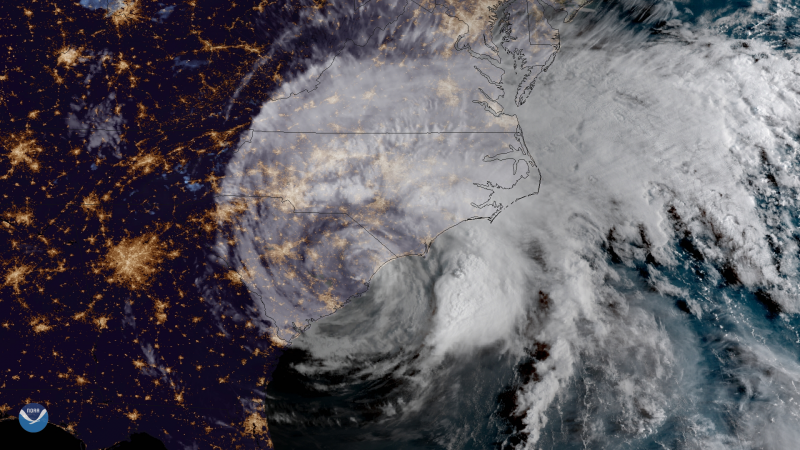 Soon after the eye of Florence passed over the Carolina coast, hurricane scientist Hal Needham was on the beach with a tape measure assessing the impact of a storm that weakened, but stalled as it made landfall. The storm surge probably didn’t reach here. The storm surge seem to come up to the dune field. Florence was a lumbering, lingering generator of storm surge and heavy rain. The really extraordinary thing about this storm wasn’t the wind category when it hit the coast. It was the fact that it stalled out, enabling it to dump days of tremendous rainfall in places like North Carolina. So there’s a growing body of evidence that this may be related with climate change. Weather systems are pushed by steering currents like the jet stream, which is fueled in part by the temperature difference, or gradient, between the Arctic and the Tropics. Climate change is causing the poles to warm faster than the Tropics, reducing the temperature gradient. And that reduces the energy that drives the currents, slowing them and weather systems down. Enabling them to just park over a location and dump days of tremendous rainfall, which is really deadly and costly. 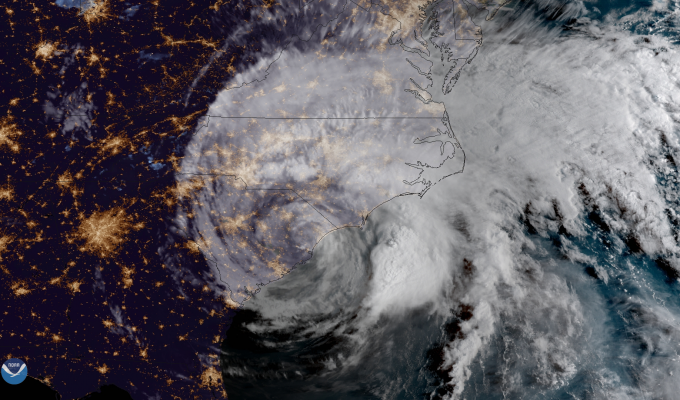 A study in the journal “Nature” in June of this year concluded, between 1949 and 2016, tropical cyclones have slowed down 30 percent when they hit land in the Northwest Pacific and 20 percent in the North Atlantic. Atmospheric research scientist James Kossin of the University of Wisconsin is the lead author. I think the question that we have to ask is what’s causing the trend, whether this is just some small piece of a longer-term natural variability, in which case maybe the storms will end up speeding up again in the next 50 or 75 years, or whether there’s a human fingerprint on it and it’s linked to warming, in which case we would expect the slowing to just continue as long as we keep warming the planet. All of these are consistent with our expectations with global warming. Kossin says Hurricane Harvey is a perfect case in point. It hit Houston in 2017, stalled out and downloaded nearly 50 inches of rain in some places over the course of a week. Florence and Harvey appear to be cut from the same cyclonic cloth. So far, the former has doused parts of the Carolinas with more than 30 inches of rain. The slowdown is likely to have compounded another problem, increased rainfall totals caused by more heat and moisture in the atmosphere due to human-caused climate change. Kevin Reed is a professor of atmospheric science at Stony Brook University. When you have warmer ocean temperatures, so a warmer temperature at the surface of the ocean, you can evaporate more water vapor into the air. So that means that when you have a hurricane, there’s more water vapor up in the air, which means there’s more available water vapor to condense out and to produce rainfall. And so it’s a combination of the slowing of storms, as well as the increased rainfall due to the increased water vapor in the — in the atmosphere in a warmer world. Hal Needham does his field work in the immediate aftermath of a storm to get a precise idea of what happened. Before Florence formed, we met at the landmark Deering Estate south of Miami. It sits on the shore of Biscayne Bay in a place vulnerable to storm surge events. Really, for Southeast Florida, this particular area ha seen a lot of really high storm surges from hurricanes, and so there’s really a geography to it. In 1992, Hurricane Andrew inundated the Estate with a 17-foot storm surge. Needham showed me the telltale scars on this tree where the bark had been rubbed off by the raging seawater. When we think of coastal flooding, sometimes, we think of saltwater slowly coming up. During a storm surge, the water is pushing in, in incredibly rapidly, and it’s filled with debris. And it can actually rub tree bark off of trees. And this is a sign where we can come back here and see how high the water level got. And despite the current conventional wisdom, Andrew wasn’t Miami’s worst-case scenario. It wasn’t a direct hit on the heart of the city. And it was a tight, fast-moving storm, nothing like the days-on barrage of Florence, Harvey or Irma. To get a better overview on the real high watermarks, Needham has spent the last decade building a comprehensive data set of coastal flooding for at-risk U.S. cities. It is pretty time-intensive. And to do it right, you really have to get in — into the local archives. You can only do so much online. So getting into local archives, looking at historic maps, talking to historians and librarians, and getting those big events from the past, the reason that’s important is that hurricanes are very rare events. And so any given location might see two or three direct hits in a century. It just rained like crazy for about a half-an hour. And there’s one other important factor at play, sea level rise. On the day Needham and I met in Miami, a brief thunderstorm rolled through his neighborhood just before my arrival, a typical event on a summer afternoon in South Florida. And so now is this scene on his street. That’s a fair amount of water. And so now I’m just — in your head, you sort of try to interpolate to a hurricane. So, that’s exactly it. This is just — there’s no named storm. There’s no advisories, no flood warnings. This was just a thunderstorm. Climate change-induced sea level rise has saturated the porous limestone on which this city was built. So this is what we sometimes called compound flooding. It’s — there’s the issue of the heavy rainfall. But, on top of that, we have the issue of sea levels rising and, if there’s a named hurricane, pushing storm surge as well. If this is what happens from an inch of rain on a summer afternoon, what happens when we get a named storm with 10 or 15 inches of rain, and we get a massive storm surge, and then sea levels are rising at the same time? What happens when a named storm is bearing down on Miami is at the heart of Frank Rollason’s job. We have a raft of maps that we are able to go through that give us a various assortment of options and scenarios that could happen and that have happened in the past. And we can see what the results of those were. He heads the Office of Emergency Management for Miami-Dade County. He is keenly aware of the complexity of compound flooding. Changes in the flood zones take place, and we have to adjust for that. So, the bottom line is, is that, in the end, this is our most current one that is up to date that we will utilize to make the decisions on the relocations or the evacuations. So, how accurate are the maps Rollason relies on? Needham believe not enough data is funneled into the models on which the flood maps are based. He says part of the problem is a distinct division of expertise. In general, in the science of hydrology, we have people that study storm surge, and we have people that study rainfall, and sometimes the two camps don’t talk. So, the map — the evacuation maps and the flood maps coming out as Harvey approached the Texas coast where — we had rainfall maps, and we had storm surge maps, and the two weren’t really talking to each other. In addition to his archival research, Needham has developed an online resource called U-Surge to share detailed historical data and is creating an app, U-Flood, where anyone could add some data points to the current flooding picture. Crowdsourcing may be one way to better define the real risk posed by hurricanes in a warming world. It’s apparent the risk is growing. For the “PBS NewsHour,” I’m Miles O’Brien in Miami. So this means such strong hurricanes will become a common affair.